Country Music hairstyles: Taylor Swift, Julianne Hough, Martina McBride, Carrie Underwood, LeAnn Rimes and more! Any Country Music event draws big names and beautiful manes… the CMT Music Awards was no exception. We’ve picked our faves (and a couple of unfaves) to show you the hair fashions that ruled the runway. Taylor Swift straightened her hair! This was big news at the CMT Music Awards because fans are used to seeing Taylor Swift in her wavy curls. You can imagine the time it took to first blow dry her hair smooth and then making it even smoother with a straightening iron. Next to Taylor, Julianne Hough plays it straight using the same kind of techniques as Taylor. Unless you’re used to it the straight-as-a-ruler look can be too time-consuming to wear every day. In that case, simply do a quick blow-dry with a tight-bristled brush. Work with small sections of hair if you can spare the time. It was refreshing to see so much straight hair along with the standard Country Music curls. It’s also unusual to see straight on short to mid-length haircuts. Martina McBride goes in between long and short with ends of hair resting on the shoulders and a little below. The do has the feel of a shag but it doesn’t have heavy layers to call it that and it’s more polished than most shags. The blunt side bangs, angled fringe and kicky ends create special interests. Meanwhile Steel Magnolia’s Meghan Linsey takes the shortest short cut shown here. We’re loving the textured bob in white-hot blond. If your hair has a little body and good layering , styling is easy. Just lift and roll the top while blow-drying and tousle the ends. Anywhere you want more curl, use a styling iron or Velcro® rollers. 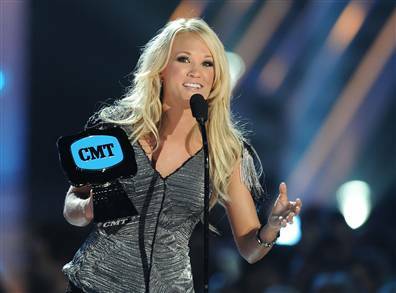 In the music category, Carrie Underwood was a big winner with the CMT Video of the Year and Performance of the Year awards. Like Taylor, the American Idol chose the unexpected: straight instead of curly. On the Red Carpet, her straight locks were worn sleek and back. On stage, Carrie let her hair down and messed it up. Compared with the other long straight styles, Carrie’s down do is fairly quick and easy: simply blow dry with a big round brush. The rest can be dried upside down using your fingers to scrunch up the straightness. If you want to calm it down in spots, do a quick turn with the curling iron held vertically. A gr8 way to go curly! Erin Andrews was one of the many celebs who took the safe route: curls. The ESPN sports analyst mixed it up with a smooth top and large ringlets below. Again it comes down to the time and effort you’re willing to spend to get a close copy of Erin’s hairstyle. Her curly locks have been blown-dry smooth on and near the crown. The rest has been finger curled while drying with a diffuser. Unless a blow-drier can dress up the curls, it would need to be followed with curling-iron styling done vertically. These two words sum up the normal state of hair-affairs for LeAnn Rimes and Snooki (more so for her). Leann could look pretty in bangs a nd unkempt straight locks. For some reason, her Cheating Heart coif never looks very good. (In all fairness to LeAnn a closeup shot is pretty flattering but we’re withholding that for now). And what can we say about Snooki’s exaggerated beehive? Ridiculous, cartoonish, downright ugly? We won’t EVEN deign to tell you how to do their dos! We can’t leave you with that, so we’ll close with Sheryl Crow’s loose back-do, Sarah Buxton’s wavy mid-length, Hayden Panettiere’s short update and Laura Bell Bundy’s look of love! What more can we sa y?